Some Combat Dogs Suffer Post-Traumatic Stress, Too : The Two-Way The U.S. military is learning now to treat PTSD in its canines. The shock of war can be just as hard on them as it is on humans. The remedies can be as simple as exercise or involve the same medications given to humans. 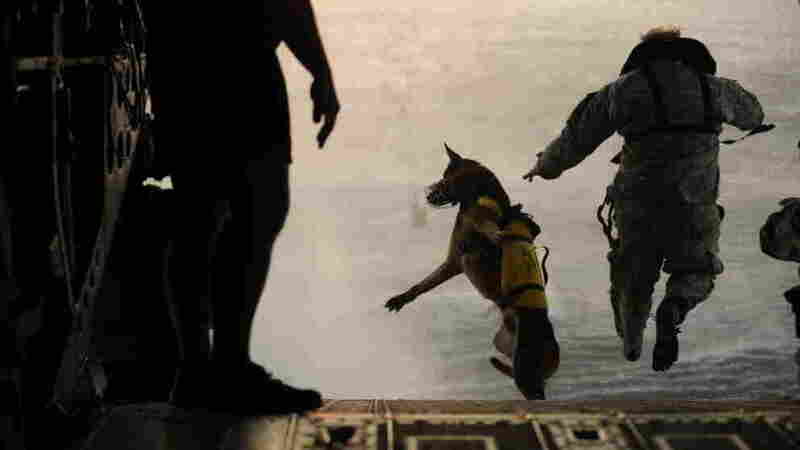 A U.S. Army soldier with the 10th Special Forces Group and his military working dog jump off the ramp of a CH-47 Chinook helicopter from the 160th Special Operations Aviation Regiment during water training over the Gulf of Mexico as part of exercise Emerald Warrior 2011 on March 1, 2011. Dogs who have served alongside U.S. military personnel in Iraq and Afghanistan now typically go on to live with their handlers in the civilian world after their service days are over, as All Things Considered reported in August. That's a change from the past, when many combat dogs were euthanized once they were done working with the military. "The four-legged, wet-nosed troops used to sniff out mines, track down enemy fighters and clear buildings are struggling with the mental strains of combat nearly as much as their human counterparts. "By some estimates, more than 5 percent of the approximately 650 military dogs deployed by American combat forces are developing canine PTSD [post-traumatic stress disorder]." The care they get, according to the Times, "can be as simple as taking a dog off patrol and giving it lots of exercise, playtime and gentle obedience training" or involve "the same medications used to fight panic attacks in humans." The dogs' welfare is important, obviously, because no one wants them to suffer. Some become aggressive. Others turn "clingy and timid," the Times says. But there's also this problem: Some stop doing the work they're trained to do. For more: In May, Foreign Policy put together a story and slideshow about "war dogs." Foreign Policy deputy managing editor (and chief canine correspondent) Rebecca Frankel posts about the "war dog of the week."